The BCCI has earmarked April 5 as the starting date and May 21 as the day of the final for the 2017 edition of the IPL. Both matches will be hosted in Hyderabad, as per IPL norms, with the defending champions getting the rights to host the opening and final match of the tournament. A senior BCCI official told ESPNcricinfo that the dates were subject to confirmation from the Lodha Committee, which has been put in charge by the Supreme Court of India to oversee all the board's activities. If the dates are confirmed, the tournament will be held less than a week after India and Australia finish the final Test of their four-match series in Dharamsala, scheduled to end on March 29. Additionally, the IPL final will be played 10 days before the ICC Champions Trophy, which starts on June 1 in England. The Lodha Committee had recommended a 15-day window to separate India's next assignment after the IPL. However, the BCCI had told the committee that this would not be possible in 2017. The decision was taken at the IPL governing council meeting in Delhi on Tuesday. It was also decided that the players' auction will be hosted on February 4 in Bangalore. "We have to set up a calendar and, assuming that we get all the approvals from the Lodha Committee, we will go ahead as per our plan," the official said. Confirming the dates, IPL chairman Rajiv Shukla said the BCCI will also make sure venues in Maharashtra can host IPL matches, unlike this year when a court order forced matches moved out of the state, which suffered a severe drought. The Bombay High Court had ruled that it was not suitable to hold matches at grounds which consumed a lot of water. "We will have water harvesting technology at stadiums in Maharashtra to counter drought threat in the state," Shukla said after the meeting. "We will ensure that we can generate our own water to maintain stadiums." Last edited by BangaloreaN; 04-05-2017 at 08:20 PM. Last edited by BangaloreaN; 04-05-2017 at 08:13 PM. Last edited by BangaloreaN; 04-05-2017 at 08:16 PM. 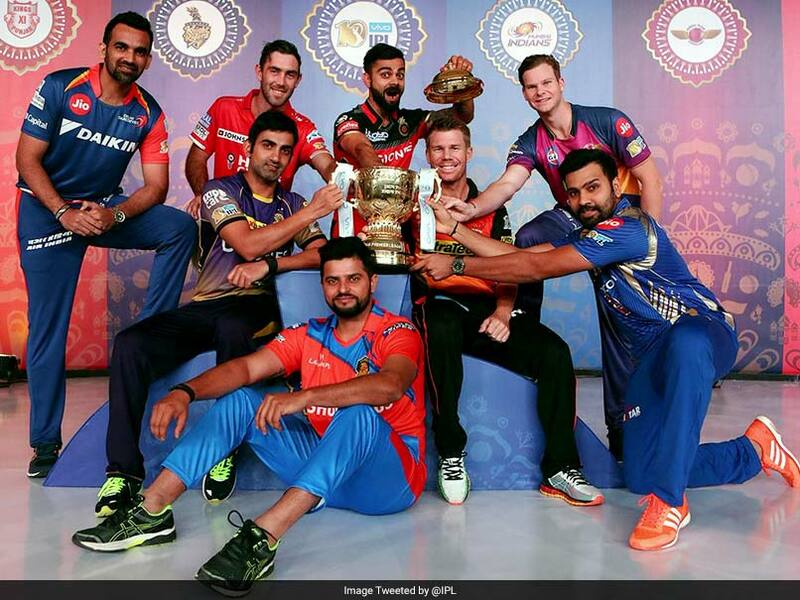 IPL 2017 Schedule is yet to be announced by the governing council of the Indian premier League . As per the previous sessions of the IPL it might also schedule to start from April 2017 to May 2017 . This session of IPL will also known as the Vivo Ipl 2017 because Vivo Electronics got the title sponsorship to 2 year after Pepsi terminated the contract back in 2016 . Like last year former IPL champions Chennai Super Kings and Rajasthan Royal will not participate the the tournament till this year . 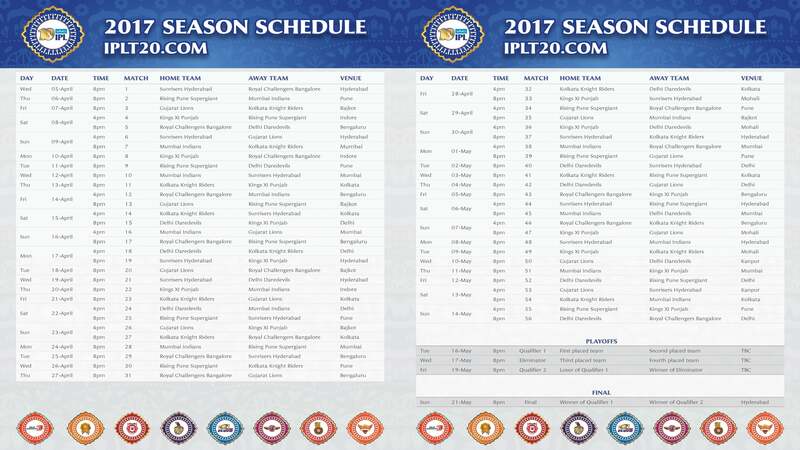 As per the schedule set by the IPL Committee, the Indian Premier League 2017 would be starting from 3rd of April and continue till 26th of May 2017. The first match of IPL 10 will have the IPL 5 winner Kolkata Knight Riders battling against Delhi Daredevils. The inaugural match as well as the final match of the IPL 2017 championship scheduled for 26th of May would be hosted by Eden Gardens, the home ground for superstar Shah Rukh Khan owned Kolkata Knight Riders. There would be 72 matches all total throughout the entire IPL 2017 championship. The matches would either start from 4:00 p.m. or 8:00 p.m. Besides, there will be a 1st Qualifier round, an eliminator Round and 2nd Qualifier Round followed by the Final match. The 1st Qualifier and Eliminator Round would be on 21st and 22nd of May respectively and would be hosted by M.A. Chidambaram Stadium, Chennai . The 2nd Qualifier Round would be on 24th of May and is scheduled for Eden Gardens, Kolkata. The Indian Cricket Board (BCCI) is walking on very thin ice as far as the 2017 edition of the Indian Premier League (IPL) is concerned. With the T20 tournament scheduled to begin on April 8, there are only four months left before the first ball is scheduled to be bowled and the BCCI says "not a single contract has been signed yet". From hosting of player auctions to planning logistics, hiring of creative and management agencies, advertising the league and signing up with a host of vendors for the two-month long cricketing extravaganza have been pending for more than two months already . After the Supreme Court hearing got adjourned from December 5 to 9 on Monday ,a top BCCI official admitted that the Board was staring into an abyss with the IPL. 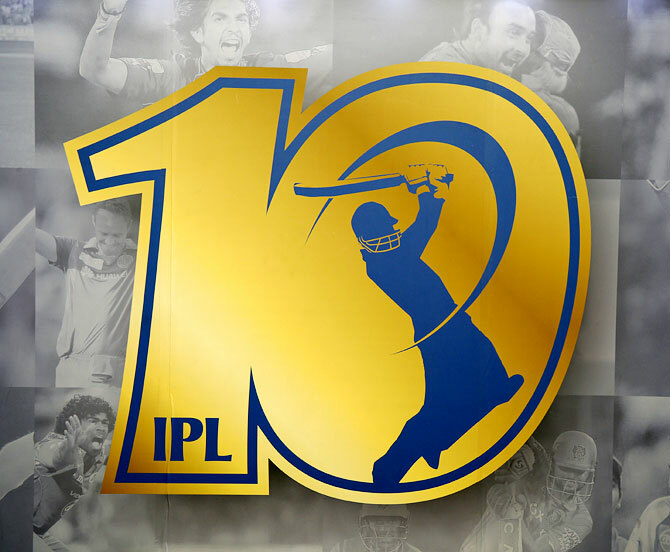 "The International Management Group (IMG) begins work on IPL every year at the beginning of October. They're not on board yet. The opening ceremony is usually planned five to six months in advance.There's no word on it. It's absolute chaos," a senior BCCI functionary told TOI on Monday . Another source revealed that communication with the Justice RM Lodha Committee in this regard elicited a one-line response: "Wait till December 5". The BCCI, however, has a flurry of questions which they've been fretting over. "The (Lodha) Committee was asked to appoint an auditor and set threshold limit for contracts.The Board even requested the Committee for a meeting. But nothing has moved. I hope the Committee doesn't expect us to call some DJ Sunny from Bhatinda (pun intended) to perform at the opening ceremony . "And if the BCCI needs to match its own standards set in the past for IPL, it needs time to work on things. Given the present uncertainty , the tournament is in real danger," the official added. Broadcasters, sponsors and vendors usually begin work on sports properties at least 270 days before the start of the event. That's a calculated window during which contracts are signed and measures are finalised. BCCI secretary Ajay Shirke had written to the Lodha Committee on October 28 highlighting the image of the Board as a professional organisation had taken a serious beating because of the prevailing uncertainty and devalued revenues. The BCCI now says that continuation of such an uncertain period will further strain BCCI's revenue streams. Shirke had written to the Committee highlighting a long list of vendors that had to be appointed going into the IPL 2017 season. "It's been a month and a week now and nothing has moved," the official pointed out. The Lodha Committee, meanwhile, has shut all lines of communication as it waits for the Supreme Court to hear the matter on December 9. Legendary pacer Wasim Akram, who has been bowling coach and mentor of Kolkata Knight Riders in the Indian Premier League, will miss the 2017 edition due to â€œprofessional commitments and time constraintsâ€�.â€œBowling coach and mentor Wasim Akram will miss the upcoming IPL 2017 season,â€� KKR said in a release. The Sri Lanka veteran batsman replaces Ricky Ponting in the role. Former hotshot Sri Lanka batsman Mahela Jayawardene will take charge of Indian Premier League (IPL) side Mumbai Indians for the IPL 2017 edition, the Mumbai franchisee announced on Friday evening. The Sri Lankan cricketer, who played for Kings XI Punjab, Kochi Tuskers Kerala and Delhi Daredevils in the past, replaces Australian cricket legend Ricky Ponting as the chief coach of Mumbai Indians. The 39-year-old has been the batting consultant of the England cricket team under head coach Trevor Bayliss in the past. "I am honoured to be chosen as the head coach of a very exciting team which has got a winning mentality embedded to their DNA. I'm looking forward to the next IPL season. Duniya hila denge hum (we will shake the world with our performances)," the 39-year-old mentioned in a video. Thiruvananthapuram: Greenfield stadium at Kariavattom, will be ready for international cricket matches by mid-January. Around 5 cricket pitches are being prepared at the middle of the ground. Filling works for the construction of the pitch has begun. Various types of soils will be layered in the pitch. The stadium had 22 mm grass to conduct football matches. The length of the grass has been reduced to 11 mm now. Soon, it will be reduced to 6-7 milli metre as per the specifications for a cricket ground. Curators of Kerala Cricket Association are reviewing the work. Construction of the pitch is expected to be completed by December end and the stadium will be ready to host matches by mid-January. The stadium could host national-international matches, first class matches conducted by BCCI and IPL. The stadium which has international facilities could host around 50,000 people. In addition to the five pitches, 6 pitches will be constructed for practice sessions. The stadium has facilities such as flood light, media room, players' dressing room, VIP enclosure, indoor court, swimming pools, squash courts, outdoor cricket nets and outdoor games. It also has convention-conference centres, catering facilities etc.